Discover a thousand shades of green, indulge in the finest south indian cuisine and share smiles with the friendly locals. This 2-week vacation offers a great balance of guided experiences and free time to explore all while bringing in the diversity of Kerala. Stay at one of the finest boutique hotels in Fort Kochi to soak in the colonial ambience. Relax for the night at your hotel. 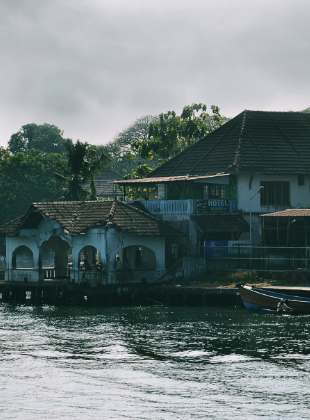 Your tour really begins today by exploring the heritage sites of Fort Kochi. You can shop around for antiques and spices, learn the history of the land and experience the culture of Kerala through its art form: Kathakali. Today head to the dramatic Munnar hills, a place that will forever keep you under its spell. In this former hill getaway of the colonial British, soak up the tranquillity and head out to the verdant tea plantations to taste the local brew. This morning, you will drive up through the hills on the way to Munnar. Stop to take a snap of the amazing vistas and views near Attukad and Cheeyapara waterfalls on your way here. Check-in to your resort and relax for a while. The afternoon would be a great time to visit the tea museum where you could explore artefacts from the colonial times besides witnessing the tea processing procedure. The evening is free for you to go shopping in Munnar town or spending time in the resort. Wake up early and catch the sunrise over the hills. Today, set out to explore other attractions in Munnar like Rajamala (national park), the dam and echo point. The terrain in the park is high altitude grasslands and features Anamudi, the highest peak (2695m) south of the Himalayas. Get on one of the government operated mini-buses and take a mild trek to amazing vantage points along with lots of endangered NiligiriTahrs. As the day unfolds take a few snaps at photo point before reaching Mattupetty dam. Spend some time here if you feel like taking a motor boat cruise. If nothing else, scream at the top of your voice at echo point and hear your voice resounding through the hills. Head back to your resort and enjoy your dinner. Enjoy your breakfast and head to Thekkady, home to one of the best managed wildlife reserves in India. With a 100-year-old artificial lake and its setting in the thickly forested Western Ghats (UNESCO world heritage site), Periyar will not disappoint with a range of activities and wildlife spotting on offer. The evening boat ride through the lake Periyar will give you a chance to spot wildlife by the river side. Arrive at the counter to make the evening ride. Relax for the night at your resort. Today you will have some of the best wildlife experiences on offer in Periyar. Pick up on any of the ecotourism activities in the reserve and spend the day in the wild. This morning our travel takes us several hours through scenic landscapes of spice gardens and tea to finally reach the backwater town of Alleppey. The ‘Venice of the East’ as it is called support a vibrant village life along the shorelines with paddy fields and palms. After traditional lunch on your private houseboat, the cruise will take you through splendid waterways of narrow canals. You will get opportunities to explore village life and the country side. Afternoons are best spent sunbathing on the deck or lounging in the shade while socialising with your crew. As you drift along, you will be amazed by the life by the waterside and witness a spectacular sunset. Experience the night life in an anchored houseboat in the middle of the lake. Overnight stay in the Houseboat. After saying goodbye to your houseboat crew, you will be taken to next stop, Kovalam, where you will find some of the most popular beaches in the country. Famed for its ayurveda centres with enough opportunities for adventure junkies, Kovalam will not disappoint. This evening is free for you to spend time by the beach side. The atmosphere will be laid back and relaxed. With lots of options around, consider dining at some of the open air restaurants around or shopping for souvenirs. The next couple of days are set aside for you to explore Kovalam and pursue activities of your interest. There are quite a few in-house activities like yoga, learning to cook with spices, or ayurveda. The outdoor options include heritage tours, water sports and village tours among others. Enjoy an aimless walk by the beach side as you watch the waves change colour or pick on some water sports. 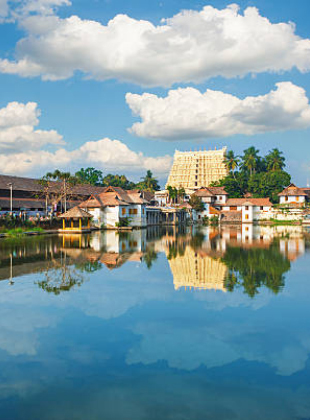 A visit to the city of Trivandrum which showcases the heritage of Kerala will be as exciting as it is insightful. Enjoy the Palaces, museums, temples and shopping or learn to cook with spices and don’t forget to pamper yourself with an ayurveda massage. Today you are at Kanyakumari, traveling past green paddy fields, wind turbines and mountain ridges to the symbolic land’s end of India. This evergreen spot will be a perfect end to you tour. Former home of the Rajas of Travancore, this palace is standing proof of the Kerala’s indigenous style of architecture. The fine detailing on carved wood adds to the charm and beauty of this palace which is unlike any other in India. This place will astound you! Take a ferry to the two-mandapa rock memorial which was built in the 1970s merging architectural styles from all over India. The huge statue of Tamil poet Thiruvalluvar on an adjacent island is the work of 5000 sculptors. Also visit the Gandhi Mandapam, an architectural marvel which has a lot of relics of Mahatma Gandhi. Sunset at Kanyakumari: It doesn’t get better than this! Watch the sun setting down as the moon rises simultaneously over the 3 seas. This marvellous sight is unique to the land’s end of India. Walk down sand and rocks to get a nice private spot to witness this! Relax for the night at your hotel.